Frank Rodgers Vandenbrouck, 89, of Hazen, Arkansas received his orders for transfer to the staff of the Supreme Commander on July 12, 2018. He was born May 20, 1929 inGrenada, Mississippi to Frank J. and Zeta Vandenbrouck. He served in theU.S. Navy during World War II, the Korean conflict and the Viet Namconflict. 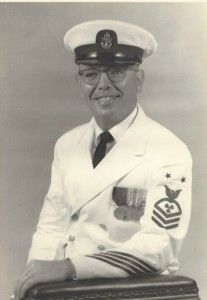 He retired in 1968 after 24 years of service. Frank was preceded in death by his father, mother, infant sister, and wives Fresina P. Vandenbrouck and Lottie J. Vandenbrouck and step-sister, Sylvia Loveless. He is survived by a niece, Rosa M. Baker and husband, Jesse of North Little Rock,Arkansas and several other nieces and nephews. Visitation will be at Westbrook Funeral Home in Hazen from 4:00 to 6:00 P.M., Sunday, July 15, 2018. Funeral services will be at theBrasfield Methodist Church inBrasfield, Arkansas at 11:00 A.M., Monday, July 16, 2018. Burial will be in the Little Rock, Arkansas National Cemetery 11:00 A.M., Tuesday, July 17, 2018. In lieu of flowers, donations may be made to the charity of your choice. The family would like to extend a special thanks to Kelly and Ellen with Baptist Hospice and Laura and care givers from Diamond Oaks Home Care.